FINALLY a low cost front BBK (Big Brake kit) solution for your C5 Chassis A6 or S6 with the 4.2L that uses the popular Porsche Cayenne caliper (6-piston Brembo) while clearing OEM 17" wheels and most aftermarket 17" wheels as well. 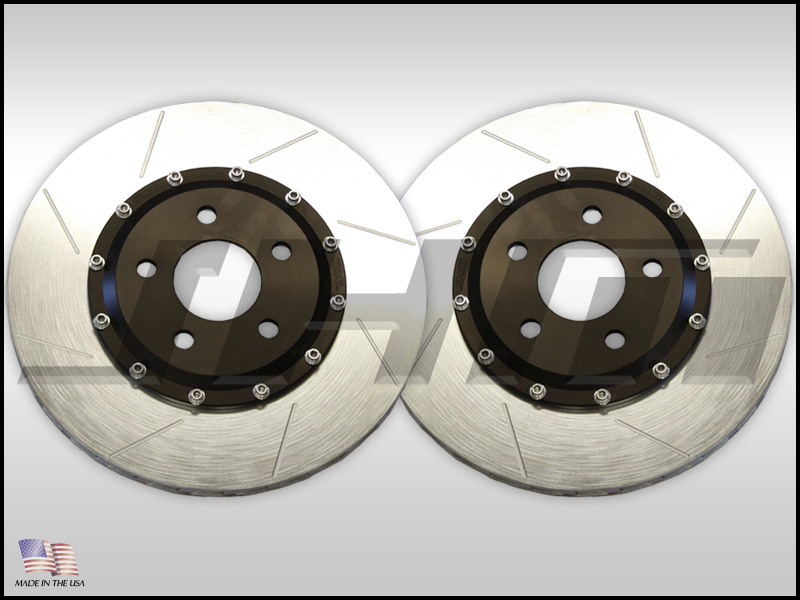 INCLUDES: 2 - JHM 2-piece Lightweight Slotted Front Rotors (330mm x 32mm), 2 - Black BRAND NEW OEM Porsche Cayenne (6-piston Brembo) Calipers (lines and bleeder screws swapped from end to end by JHM for proper performance on an Audi), 2 - Stainless DOT approved Brake Lines, 1 - Set OEM Pagid Pads or Hawk Performance Pads (select below), 2 - OEM Cayenne Brake Pad sensors (they work by only splicing 2 wires), 1 - Liter Pentosin DOT 4 Synthetic Brake Fluid and all bolts and hardware to mount the calipers with JHM exclusive 16mm to 14mm stainless bushings to snuggly fit the caliper - DOWNLOAD INSTRUCTION ZIP FILE BELOW WITH PICTURES AND NOTES (not sent with kit). 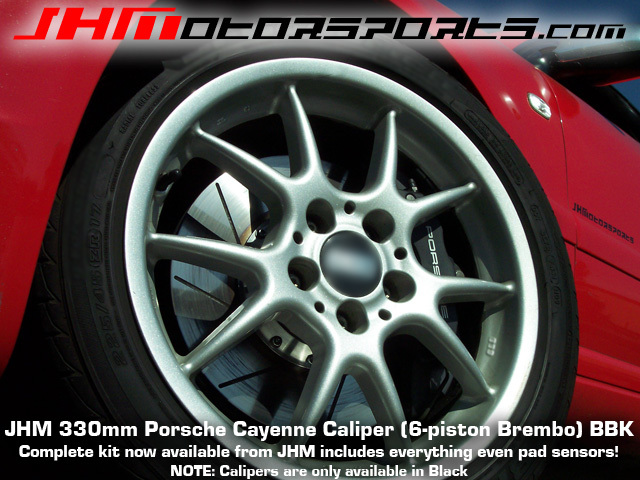 Why the Porsche Cayenne caliper? With its 6-piston design and MASSIVE brake pads it is a strong performer. Also, it bolts right up to your spindles with NO brackets. All you need is some bolts, nuts, brake lines, and JHM rotors and you have a 330mm BBK. Being that it is an OEM part they are readily available and can be found used for great prices. Note - This brake upgrade only fits under 17" wheels or larger. It fits stock 17" C5-A6 4.2L wheels with NO wheel spacer and most other OEM and aftermarket wheels as well.